Starting with Retrospect 9.5 for Windows, you can change the language of Retrospect from the Control Panel. Navigate to Control Panel > Clock, Language, and Region > Change the date, time, or number format. Select your preferred language in Formats > Format. 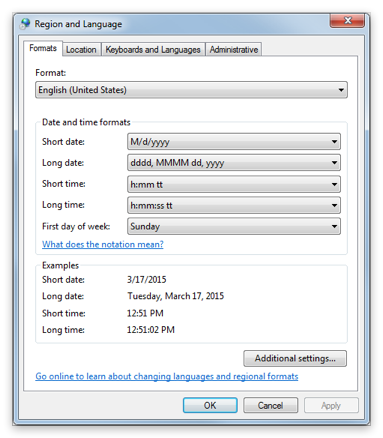 Retrospect for Windows supports English, German, Spanish, French, Italian, and Japanese. Relaunch Retrospect. The app will now display in that language. If you want to use a specific language (i.e. Retrospect in French on a system that is Dutch), you can set the language manually in the INI file, located in C:\ProgramData\Retrospect\retro.ini. Simply follow the instructions and add the language, like SetLanguage=L_french.